Musing Music presents the hottest music on SoundCloud on a monthly basis from July 2007 to Today. 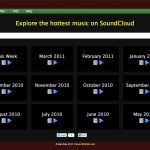 The Top 10/25/100 tracks of each month can be sorted by plays, comments, favorites, or downloads. Additionally, Musing Music provides the ability to search SoundCloud for tracks, playlists, users, or groups. Each search result contains a play button to enable immediate playback of the associated tracks. 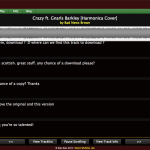 The music discovered at Musing Music is played using the Musing Music Player, which allows for automated comment scrolling and the ability to seek to the specific place in the track where the comment was posted.